What It’s About: A team of archaeologists find the tomb of Im-Ho-Tep, an Egyptian prince. A team member reads the Scroll of Thoth, found with the prince, aloud, and Im-Ho-Tep returns to life, wandering into the desert. 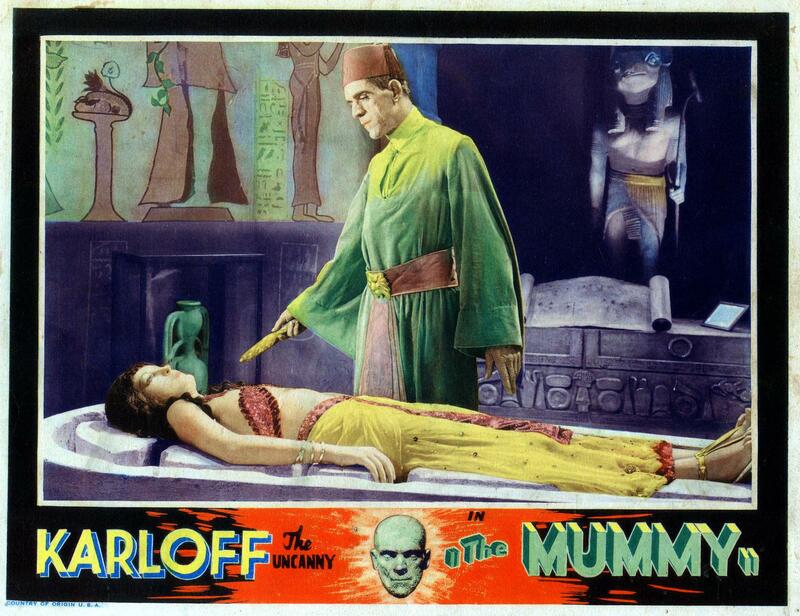 When Sir Joseph Whemple (Arthur Byron) returns ten years later to excavate the tomb of Im-Ho-Tep’s love, a mysterious man named Ardeth Bey (Boris Karloff) helps the expedition for reasons of his own. Bey uses his powers to mesmerize Helen Grosvenor (Zita Johann), the reincarnation of Im-Ho-Tep’s lost love, and it’s up to Whemple’s son Frank (David Manners) and Dr. Muller (Edward Van Sloan) to stop him. The 1932 version of The Mummy is a bit too close to its ancestor Dracula, perhaps, but it is a better paced film, with a great performance by Karloff and some wonderful mummy make-up by Universal make-up guru Jack P. Pierce. Unlike its largely unrelated sequels or the later Hammer Studios mummy films, we are not expected to suspend our disbelief while characters fail to realize they can easily outrun slow-moving mummies, setting this film apart from most of its descendants. This entry was posted in Black and White, Horror, Movie of the Day, Mummy, The Original and tagged Boris Karloff, Carl Laemmle Jr., cash-in, Edward Van Sloan, Jack P. Pierce, John L. Balderston, Karl Freund, lost love, Noble Johnson, punishment worst than death, reincarnation, rip-off, Universal Pictures. Parallels to Dracula (which become extremely noticeable if you’re, say, me during a Universal Classic Monsters marathon) notwithstanding, this is still my favorite Mummy movie. And hell, the door swings both ways: Francis Ford Coppola’s Dracula is a better remake of The Mummy in almost every meaningful way than Stephen Sommers’ actual remake of The Mummy. Oh, I agree 100%-this is my favorite mummy movie, too, though I must admit, I’d love it if they’d made an extremely Pre-Code Cagliostro film as well. In fact, I far prefer this film to the 1931 Dracula; Karloff is just so damn good in it. Not sure I would consider the Coppola film a “remake” of this in any real sense, I confess to having a weak spot for Sommers’ first Mummy film. the director of this movie wound up being the director of photography for the I LOVE LUCY tv show. the TALES FROM DARKSIDE MOVIE had best way to deal with a scary mummy—just take an electric carving knife to the dried out creature, to easily cut them to peices.